The Lensbaby Spark Nikon Fit is a lightweight, all plastic bodied 50mm selective focus lens with a f/5.6 fixed aperture and is designed to be a fun way to capture selective focus images with a digital SLR. The Lensbaby Spark features a unique selective focus optic and a tilting lens body, allowing the aspiring enthusiast photographer to capture creative images in-camera that have a sweet spot of focus, surrounded by blur. 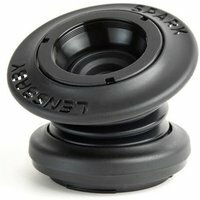 The Lensbaby Spark is compatible with the rest of the optics in the Optic Swap System, and with all Lensbaby 37mm threaded accessory lenses.